Tuesday is a significant day in history for Wisconsin. 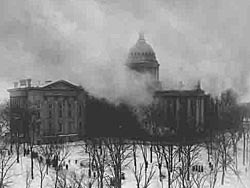 Until 1900 the Historical Society was located within the capitol building and Mattern says they had been lobbying for years to be in a fire-proof building. They got out just in time, preventing the loss of many valuable artifacts and other pieces of history. Losses were estimated to be close to $1-million.